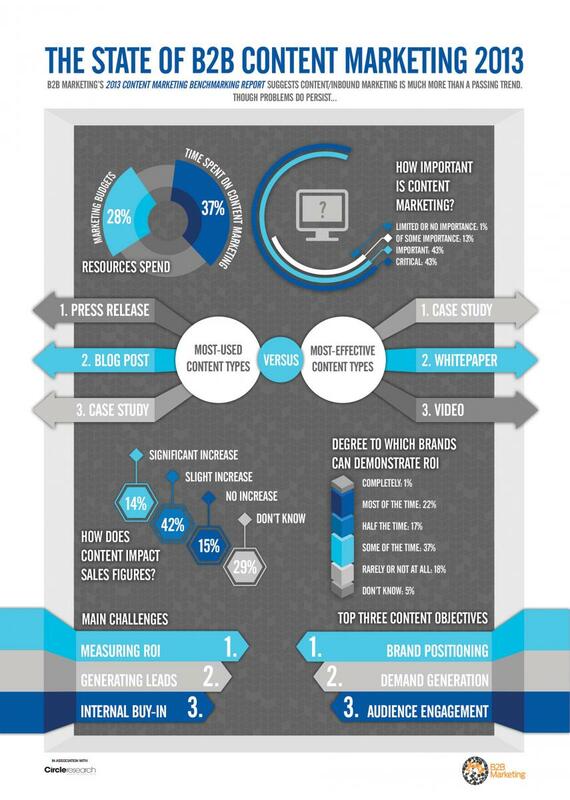 Is you content marketing effective? If you have a website, blog or social page you will be involved to some degree in content marketing. If you have fully embraced the idea you may be creating your own video or producing white papers. To some degree you will be involved in the creation of content but are you getting the best return on your efforts? Looking at at what others are doing can give you some useful pointers for examine your own activity and stratedgy. The recently released Content Marketing Benchmarking Report from B2B Marketing does just this . The survey highlights key trends and activities in B2B organisations based on a research project with 177 participants. They produced the infographic below based on the results. Two things stand out for me. the first is the most used content types v the most effective content types – most of the respondents are not using what was seen as the most effective types of content marketing. So here is the pointer are you checking to see if you could produce better (more effective) content. Video and white papers may be harder to produce but they deliver a better result. Even if you have limited resources try different things on a regular basis and see if your response or engagement improves. Don’t forget there are tools available that can bring all mediums within the smallest budget. For example you only need a smart phone and app to create your six second video with Vine! Checking to see if you are getting a better result brings me to the second stand out point. If you do not measure the outcomes/ROI of what you do how can you tell what is effective or not? Maybe if more of the survey participants know what produced good ROI ie effective content, there might be a better correlation between most used and most effective. You can see here that 30% did not know if their content had an impact on sales at all and 60% could only show ROI some of the time through to not at all. So the pointer here is look at how you measure your ROI. Create content with clear marketing intent, and specific calls to action that can be measured and evaluated. Make sure you have set up your analytics to record what you need to know. Involve your sales teams so you are able to follow your initial contacts through to completed sales. These can be complicated tasks in a large organisation or a resource issue in a smaller business however if you are making the effort to create the content taking these other steps will ensure that the effort is not wasted and that you content marketing is effective.